The most common question I get when it comes to resin is why should I add it to my project? I personally like to add resin for aesthetic reasons! I love how glossy and professional it feels. Aside from looks, it also adds a physical layer of durability to your project. 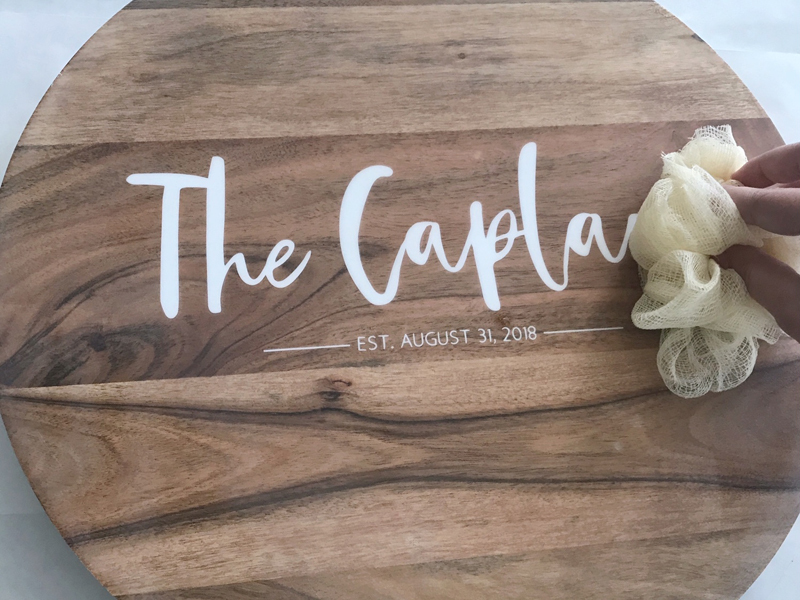 It turned this wooden tray into a waterproof, wipeable surface! And it gives me peace of mind that no matter how beat up this tray gets, my iron-on will not come off! If you have the time and patience, I think resin is always a good idea! Before I started, I removed my wooden tray from the metal holder. I then used my Cricut Maker to cut out some iron-on and adhered it to the wood using my EasyPress. Vinyl will work as well, however, I chose iron-on because you can cut your letters a little smaller than you can with vinyl. 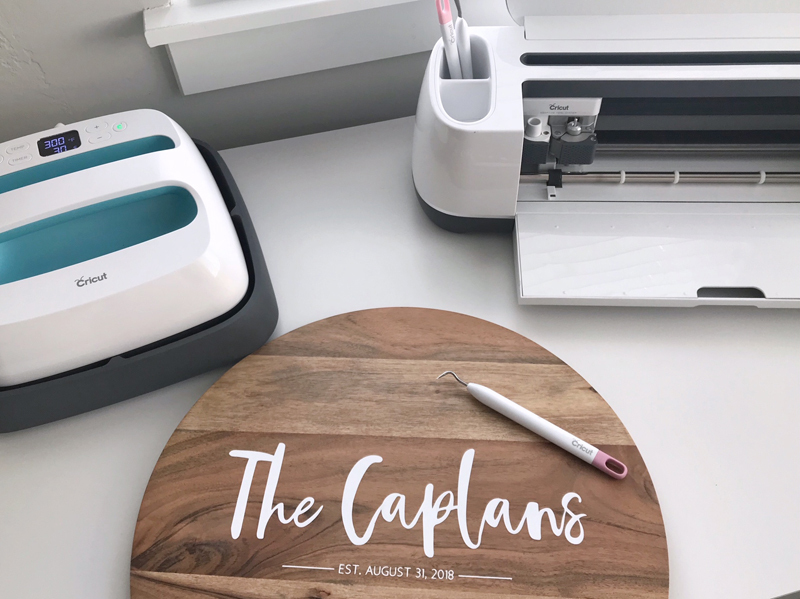 Prep your workspace before you start mixing your resin. I used a large self-healing mat and covered it with freezer paper (shiny side up) on top. I love freezer paper because the resin does not soak through it. I taped it down with painters tape to make sure it would not shift. After I had my table and tray prepped and ready, I prepared my resin. Depending on the resin you purchase, follow the instructions closely! I follow the instructions to the letter to ensure my resin will cure properly. Resin comes in two parts—the resin and the hardener. Use a mixing cup with actual measuring lines! This is SUPER important because if your two components are measured incorrectly, your resin will not harden and will be sticky or have soft spots even after the curing time has elapsed. In the photo above I included a clear plastic cup that I would NOT recommend using to measure. However, you can use these cups to transfer your mixture during the “doublecup” method which you will learn more about! It’s time to put your gloves on! Resin can irritate your skin, so protect your hands. Pour your resin in one mixing cup and then add your hardener. Resin and hardener are mixed together in a 1 to 1 ratio. 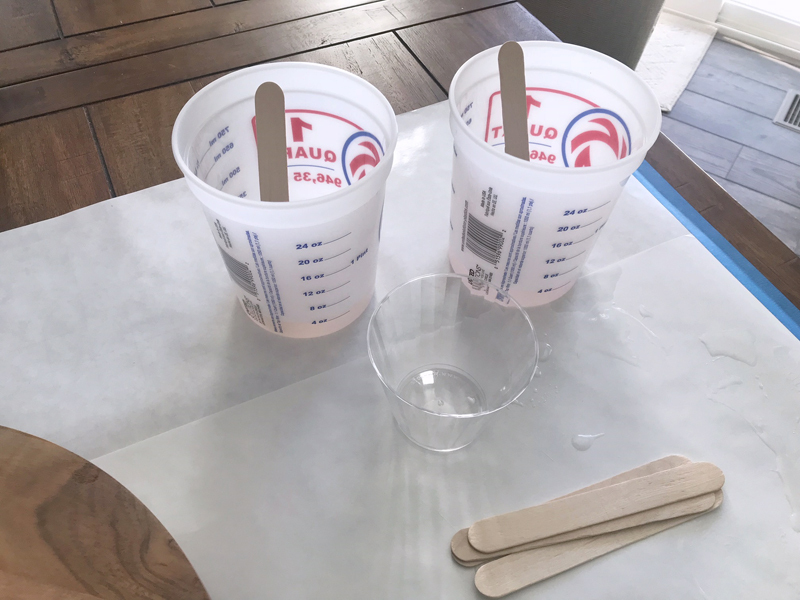 I like to use a paint stirring stick for large batches and popsicle sticks for smaller batches. For this project, I poured 4 ounces of the resin and then added 4 ounces of my hardener. On most manufacturer instructions there are guides on the amount you should mix per square foot. I tend to overestimate—it is always better to have too much rather than too little. I stirred the batch together for almost 2 minutes and then transferred it to another mixing cup and continued to mix for another minute. 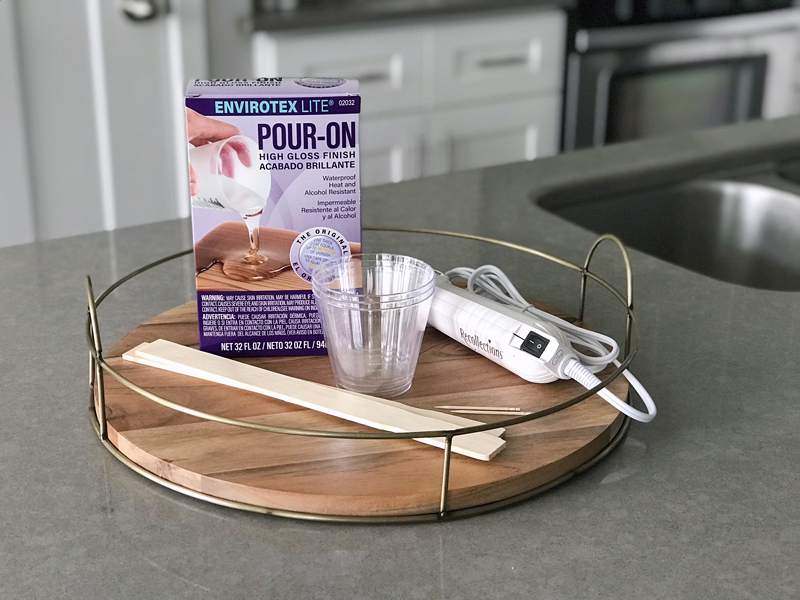 Environtex calls this the “doublecup” method of mixing. Mix in one cup for a minute or two and then transfer the mixture into a second container and continue mixing for one minute. The instructions state that your mixture should be good to go after 2 minutes of rigorous mixing! When I first started using resin, I was always worried about mixing too quickly because I didn’t want to add bubbles to the mixture… DON’T worry about the bubbles! You can get rid of bubbles, but you cannot fix undermixed resin. Your mixture should be clear without any streaks after you finish mixing. Okay—now go, go, go! Once your mixture is ready, do NOT wait! I take this step really seriously… so there are no photos of my mixture or the pouring process… oops! Place your project on some type of riser. I used a plastic cake stand that turns. This allowed me to easily rotate my project so I could see it from all sides. Pour your resin from the center of your project out toward the edges. Do not worry about the bubbles, we will take care of those. When I pour my resin, I am not super concerned if the surface tension breaks and causes the resin to spill over. Usually, the resin will spill over onto the bottom or back of a project. For this project I ended up cutting off the drips—we will talk about this later. This is how my tray looked after I poured my resin and it had de-gased for about five minutes. When your resin sets, the gases begin to come out and cause the air to rise to the surface. Look at all those bubbles! Before you worry, all you need to get rid of those is a heat gun. I used an embossing gun and held it about 6 inches away from the surface and moved it back in forth in a sweeping motion. Move quickly so that your resin doesn’t heat up. If you notice any specks or dusk in your surface, you can use a toothpick to pick those out. A word of caution… you only have about 15 minutes from when you pour your resin, to when it starts setting. DO NOT touch your project after it begins setting. I know it is so tempting to continue to pick and heat and smooth, but this will damage your project. I usually use a large plastic storage bin to cover up my project. This not only protects the resin from dust but also creates a physical barrier that I know I can’t cross. I still like to check the progress of my project, but I won’t touch it. If you see any dents or imperfections, it is okay… don’t touch it. I try to wait 12 hours before I touch my project again. If your project isn’t perfect, all is not lost. You can sand down the surface and either pour an additional coat of resin or use a spray sealer. To give you a full tutorial experience, I chose to sand down my top and pour another coat. I used a 120 grit sandpaper block and sanded the shine right off of my project. This will smooth out any dust, dents, or imperfections on your project. Your resin will look dull until you pour your next coat. Avoid using sandpaper with a finer grit because you need your scratch lines to be large enough for the next coat of resin to adhere to. Use a tack cloth to pick up all of the sanding debris. Now repeat the mixing and pouring process! See, you’ll be a pro in no time! After my project cured for an additional 12 hours, I used a TrueControl Knife to cut off all of my drips on the underside of my project. You can also sand any remaining bumps off of the bottom. I wasn’t too concerned since no one will see them from the top of the tray. I attached it back to the metal base and wiped it down so I could take in all of the glossy glory! 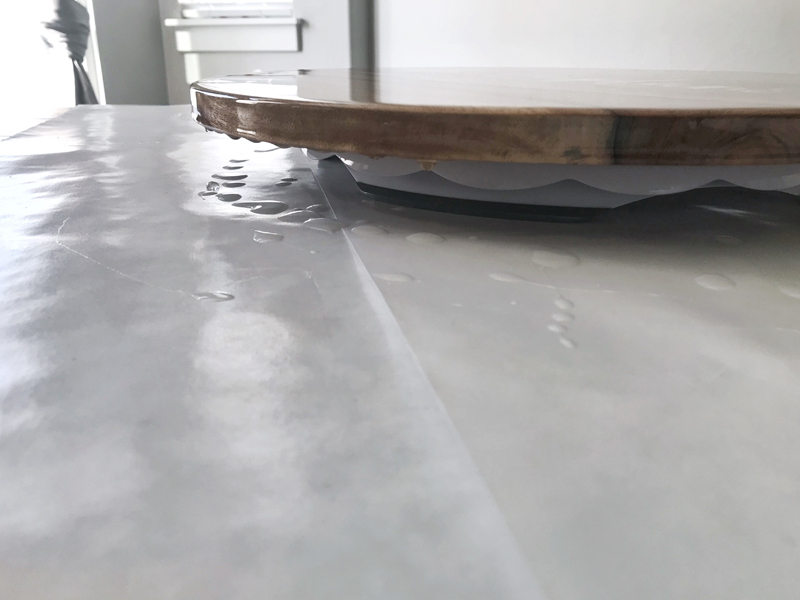 If you don’t love this glossy look, you can also sand your final coat of resin and then seal it with a matte finish sealer spray! 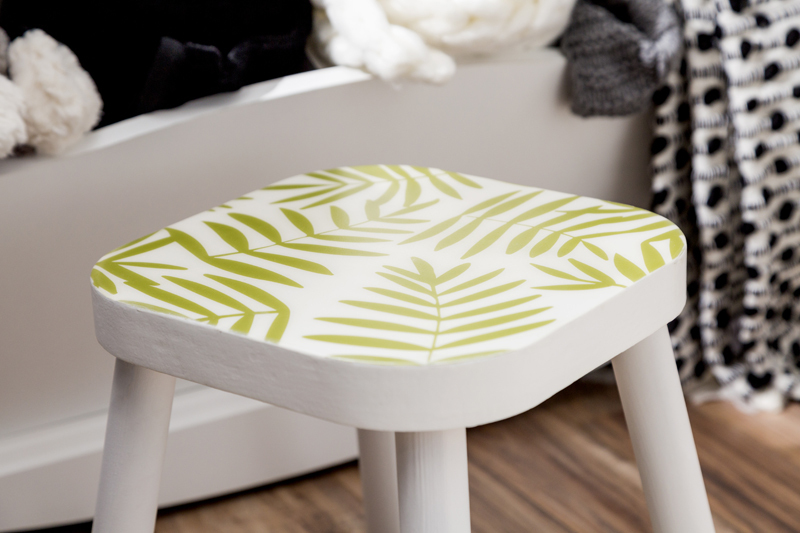 I chose to do this for a children’s footstool and I loved the look. It sealed in the vinyl and protected the surface and vinyl without the reflective, glossy look. I absolutely love how resin takes my projects to the next level. This thick, glossy layer ensures that my projects will last a lifetime and will not fall apart. Resin is heat resistant and waterproof. 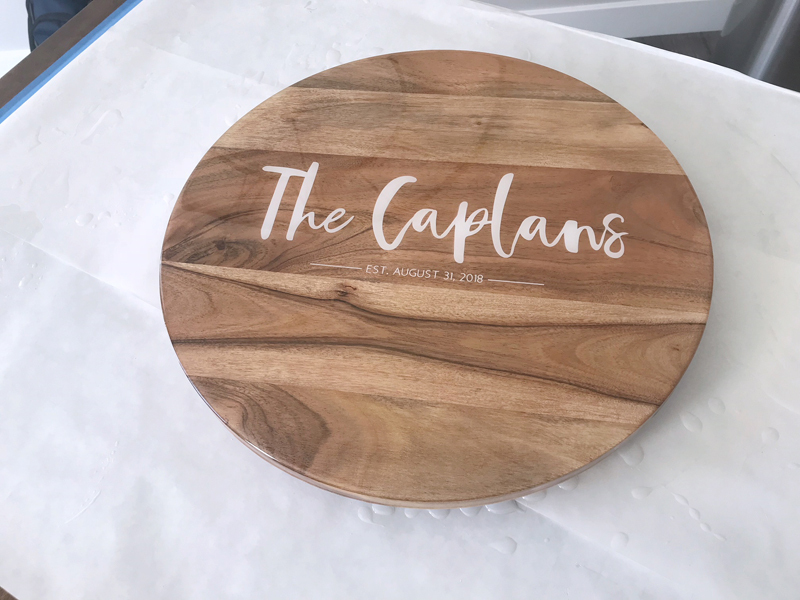 So when the Caplans are enjoying their tray, I don’t have to worry about vinyl or iron-on lifting when something spills on it. Have you jumped on the resin bandwagon? I am such a fan and am already dreaming up my next project! I loved this tutorial! Thanks! Where did you that were handle? amazing!! This is the tray I used! This is beautiful. Where did you get your tray from? This is the tray I used! I love it too! Where did you get this wooden tray? This is the tray I used! 🙂 Thanks for reading my tutorial! When using the heat gun to remove bubbles, do the bubbles come to the surface and pop on their own or does one need to pop them? Did you iron on your htv to the wood? 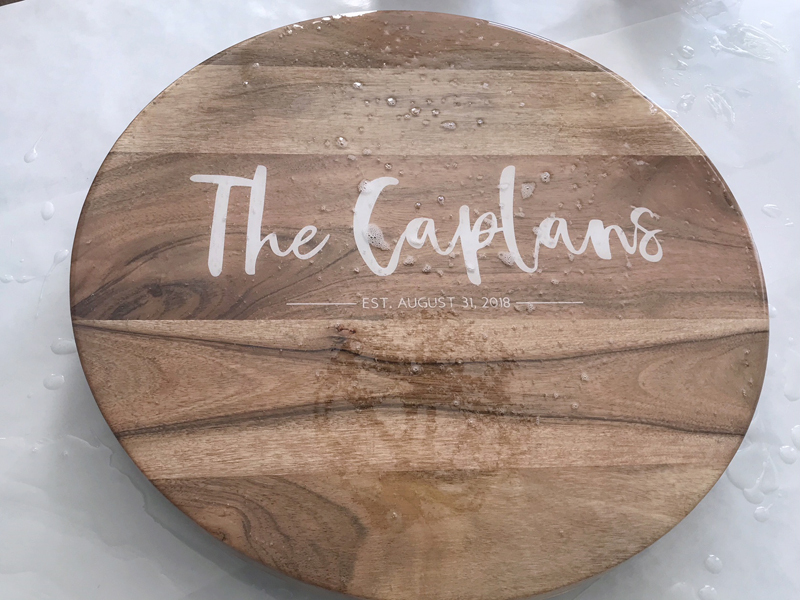 Yes, iron-on was placed on the wood using our EasyPress. 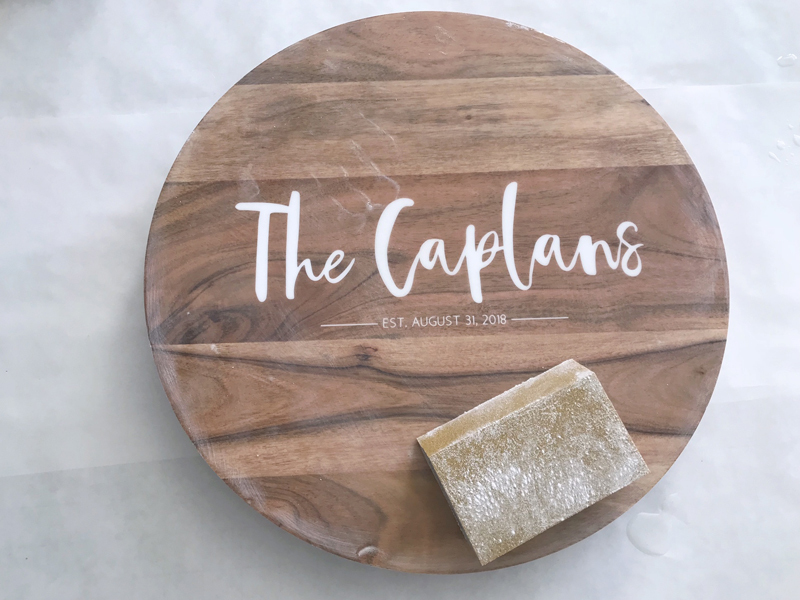 Hi, I have a cake stand with upturned edges that I was going to use vinyl and resin on. I have never used resin before, so after I pour the resin, should I use a foam paint brush to apply the resin to the upturned edges as it will not flow over the edge. Looks great!! 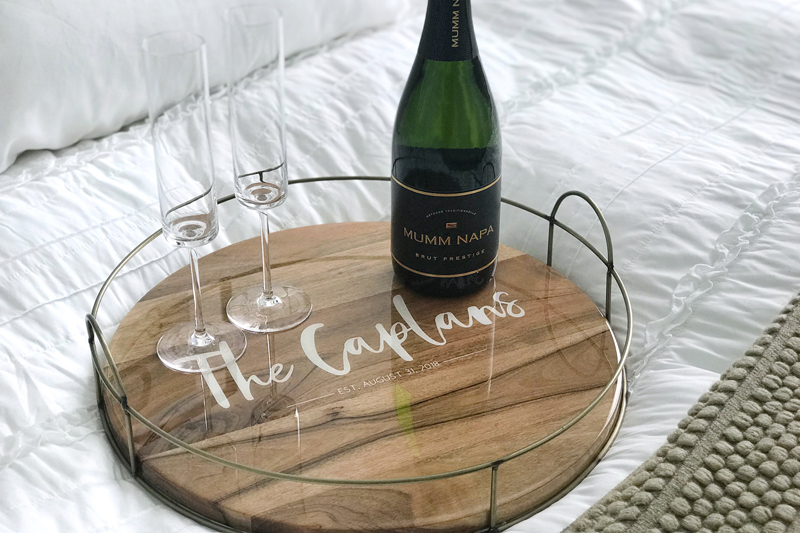 !…..love this tray…..I have a large squire tray that I have been dying to do something with and this is just the thing. Thank you very much this will help me with a project I have been contemplating. What type of font did you use for this project? I absolutely love it. Hi. The name was hand-lettering that she did. You could use a similar script font. The other font is called Dear John.